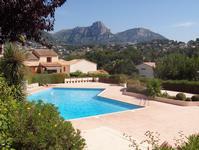 See the holiday homes in Vence on a map - click on the map! 4 persons 2 bedrooms Dishwasher Washing machine Whirlpool Internet - Broadband Distance to beach: 5000 m.
5 persons 2 bedrooms Pool Internet - Broadband Distance to beach: 6000 m.
Holiday flat for 4 people in lovely house 350m above the sea with pool and views of the Mediterranean. Lounge, dining room, kitchen, 2 bedrooms, bathroom. Vence, one of the prettiest towns at the south coast of France with charming downtown + art museums. 4 persons 2 bedrooms Dishwasher Washing machine Pool Internet - Broadband Distance to beach: 10000 m.